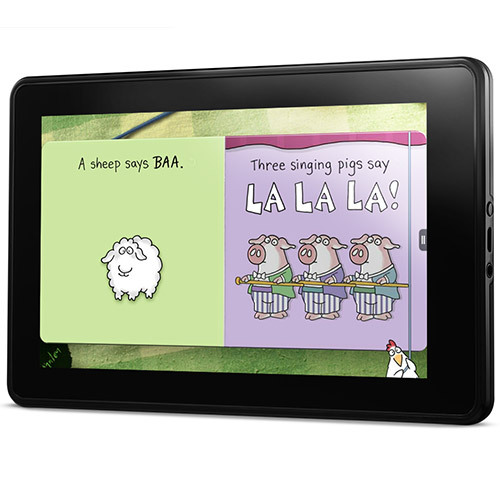 Kindle Fire HD & New Tutorial! We finally embraced some technology and bought a Kindle Fire HD ! (Which is a pretty funny statement coming from some computer programmers.) We've stayed out of the whole iPod, iPhone, iPad and cell phone craze. Our cell phone has a sweet green LCD screen, but it holds a charge for about a month and fits easily in our pocket. If ours dies my husband will be looking for another one, I'm sure. Generally, we're fairly picky about what we spend our money on. For the first time in our lives we have an abundant, stable income and it seems like the best time to update the stuff we got for free that has been falling apart or to get stuff we've been living without (I finally have winter boots!). But we're saving for the biggest item we'll ever have to purchase... a house! Finding a balance between the two is a little tricky. A tablet computer didn't fall into either. Our library has a few eReaders available, so we've been able to try a Nook, Nook Color, Kindle Touch, Kindle Fire and most recently the Kindle Fire HD. 1) I liked the E Ink e-readers (Nook, Kindle Touch) a lot for my reading, and very luckily we were able to find one for free. 2) I did not like the Nook Color. We returned it a week early. Something about the controls made it feel really clunky. 3) I really liked the regular Kindle Fire. Good for kids' books, videos and the internet. Sadly, the library didn't have any magazines loaded on it, so I didn't get to test that. Reading an adult book on it was easy enough, but I like the E Ink version better in most cases. 4) So when it was announced that our library was getting the Kindle Fire HD, we signed up right away. It was everything I liked about the regular Kindle Fire but slightly better. The sound blew me away. Really. I think it was the sound that sold me. The camera is a nice addition too. Still it wasn't enough to make us go out and buy one. We figured we'd just keep borrowing the library's. Something about the tablet worried me. For the same reason I don't like cell phones, it's like always having some sort of technology available to you. Still, the pros seem to outweigh the cons... I hope. In early December the Kindle Fire was on sale for $119, which was a tough choice but we passed on it. Later in December I got an email that the Kindle Fire HD was $30 off for Moms with Amazon Prime. And we took the plunge. I justified it because we canceled Netflix a few months ago, and don't have cable and can't have broadcast TV in this apartment... So the fact that we can hook it up to the TV and stream it on there is big plus. Plus it does a million other things that will help free up the laptop for Jon. Jon justified it because he feels he needs to be able to develop games/apps for the Android platform, and we needed a device to test it on and wanted the most development power. Still, we made it work with our budget by splitting the cost and using our allowance. 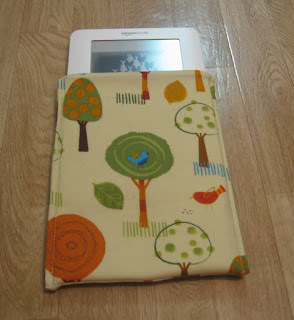 I made another Kindle Sleeve tutorial, appropriately named Kindle Sleeve Tutorial II. (You can find the first one here.) This was actually my second try on this pattern, and I think it turned out well. I tried using a snap for the closure at first. I covered the back of the snap with fleece and that was just fine, but I was worried about the kids trying to snap it together hard they would damage the screen. The next best thing seemed like simple velcro. Personally, I don't like velcro on most things (non-scratchy bibs! ), but it's perfect for this case. Not sure why I don't see many patterns or cases for sale with velcro. I had ordered that fabric on sale with no real intentions for how I'd use it, so it's nice to have a project for it. Seems fitting, since we'll be making games for the Kindle. The pocket seems out of place, and aesthetically I would have liked to go without. But the convenience of being able to carry the USB cord (and AC adapter) around with it far outweighs the looks. I think if I had used the same fabric, it would have been better. I might try to add a matching decal on the front to make it look a little more uniform. The process was so iterative that it would have been tough to take pictures as I went. I did make up a couple of them, so hopefully it's not too hard to follow.